This is a cheap way to get a high quality and flexible media center sitting under (or in my case, behind) your TV. Insert your SD card into the computer. 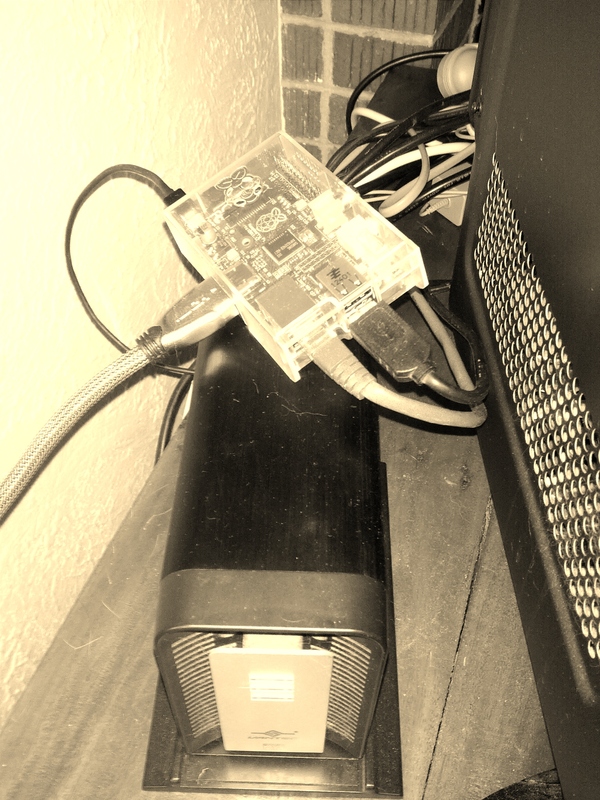 Unzip and run the raspbmc-win32 installer. Once that is done, stick the card into the Pi and give it some power. Wait while it installs the root system (grab a coffee!) This should take about 15 minutes, then with a little luck the Pi will reboot twice, run it’s automatic updater, reboot again, then finally open into XBMC . Note down the IP that is assigned to the Pi as it flashes up, or work it out by checking your router. Set up your remote. I use Yatse on my Android devices. Otherwise plug in a keyboard or mouse. I’m assuming you can get some input sorted. Go Settings -> System -> Video -> Video Output and calibrate the TV (otherwise the left sidebar ends up off screen for me). Then choose the type of Video you are adding. I’m only adding home videos, but I imagine selecting something here will check online services when you add content and pull down more information and images about that piece of content. Repeat till you’ve got all your videos and music set up. Enjoy your raspbmc media center! Be sure to power it down before resetting it. That’s the basic install, below is the more advanced stuff. SSH will be running on the Pi so shell into the ip and login using the default login, ‘pi’ with password ‘raspberry’. Select your locale – I choose en_AU UTF8 and en_AU ISO-8859-1. Sit back while locales are generated. Choose your location. Tip: Australia is one above what you can see by default. Finally you will be dumped at the CLI. Next we change the mount status of our usb drive so transmission can write to the drive. Test with sudo mount -a then reboot and check the drive automounted. My ASUS laptop has 2 graphics cards, one Nvidia and the other Intel. Ubuntu uses the Intel one by default, but that leads to poor performance for gaming. So I need to install the Bumblebee drivers. Swat PPA has the latest Nvidia drivers. [ 118.398323] [ERROR]Aborting because fallback start is disabled. The fix comes from here. Hopefully this is a bit cleaner in 13.04.